Creative quilters deserve better than 4 squares per inch! Create grid papers that are perfect for quilt planning — Set the number of squares you need, then add divisions to “pre-draw” lines for triangles. 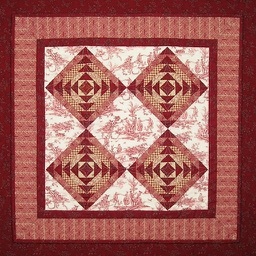 Let QuiltPaper add borders and sashing. Plan an on-point quilt using the included Diagonal paper. NOTE — If you are looking for a quilt block library, you will not find one. 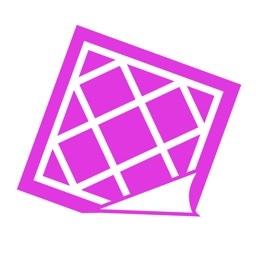 QuiltPaper app is for quilters who want to use a grid to plan and design their own block or quilt layout. 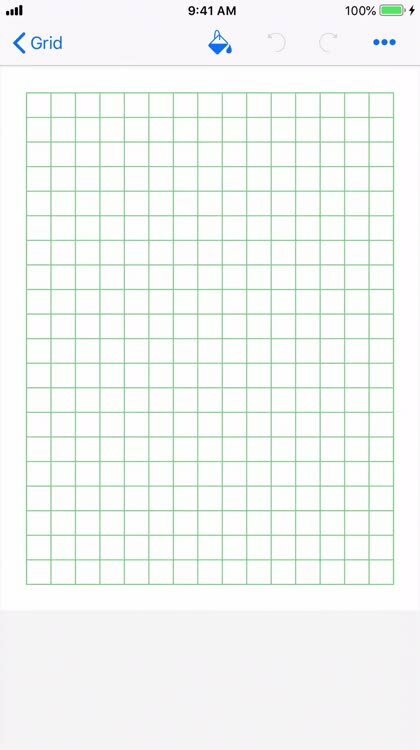 GRID — Quilters need more than classic graph paper. QuiltPaper can do most of the tedious drafting — add lines for triangles, insert sashing with cornerstones, even number rows & columns. Then, play with color to create your own quilt design! 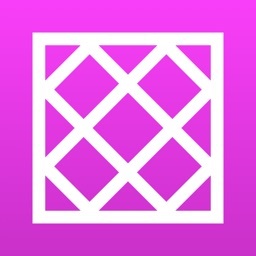 DOT — Create grids from a choice of styles & dot patterns. DIAGONAL — Create on-point designs by dividing & sub-dividing blocks. Just tap to add sashing. Create your own English Paper Piecing templates! Enjoy English Paper Piecing? Make your own templates by setting a shape to the exact size needed for fussy cut or EPP. To make removing papers easier, add a center to each piece to mark where to cut a hole so a small stick can be slipped in to help pull out the paper. 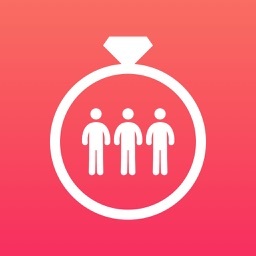 √ One purchase works on all devices — iPhone, iPad, iPod. √ Color! Tap to fill with color and pattern. Use built-in palettes, or create your own, unique palette. 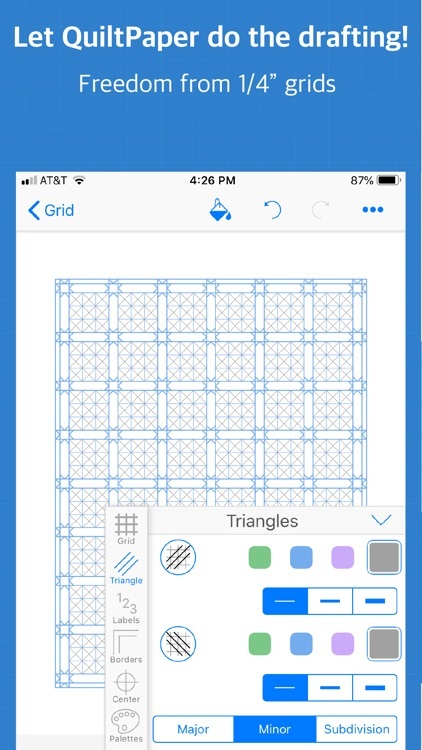 √ Tile small grids on a page to compare block designs, create color-ways, plan block assembly, or to simply save paper! 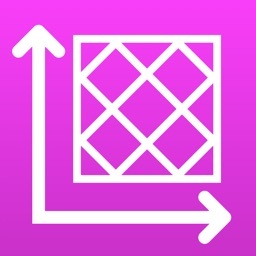 √ Save as an image to share or to import into a drawing app. √ Print Settings for standard papers (such as 8.5x11 or A4) or set to a custom size. √ Quick Pick Templates can be a jump start to creating your own unique paper layout. √ App-level settings control initial setup, and can be overridden on individual papers. Increase your creativity with In-App Purchases — each unlocked at the same cost as the app! HEXAGON — Regular or elongated hexagons can be split & sub-divided into shapes such as Tumbling Blocks. HONEYCOMB — Honeycomb or elongated honeycomb graph paper. Ideal for planning Lucy Boston style or other unique honeycomb quilt patterns. Then, print exactly the right sized English Paper Piecing Papers to sew it! TRIANGLE — Choose size, orientation, angle (or set base & height) for instant triangle quilt layouts. Play with sashing options to create unique designs. TUMBLER — Choose size, orientation, angle (or set base & height) for instant tumbler quilt layouts. Play with sashing options to create unique designs. DIAMOND — Magically create diamond paper — choose size, orientation, angle (or set width & height) — even add sashing! 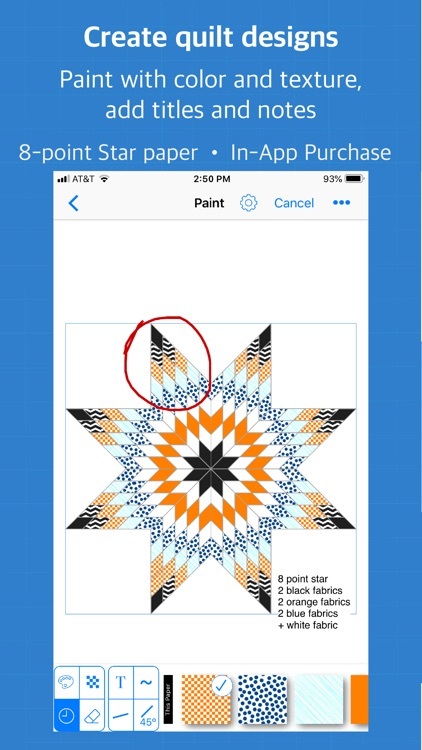 6 POINT STAR — Choose from 3 unique star patterns and 7 layouts and avoid tedious drafting. 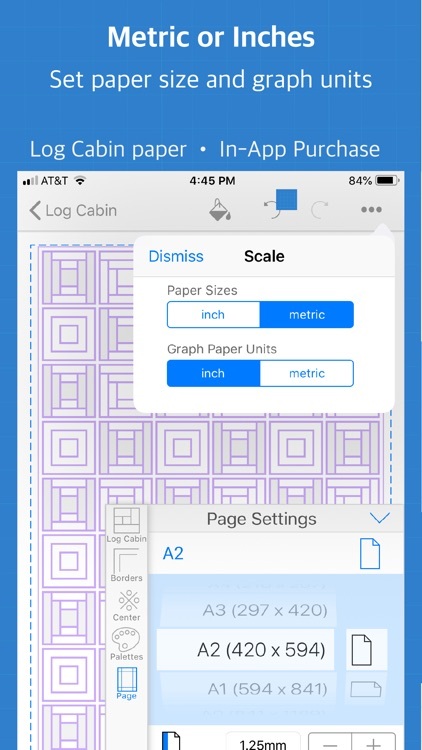 LOG CABIN — Create papers with custom or classic layouts. 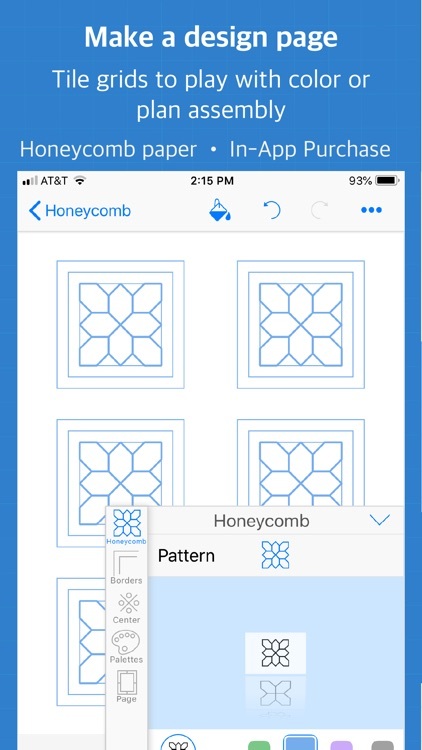 Build a grid using a library of block patterns; chose patch layout 3x3, 6x6, etc; select a set of blocks to create a repeat pattern; add sashing with cornerstones and up to 4 borders. 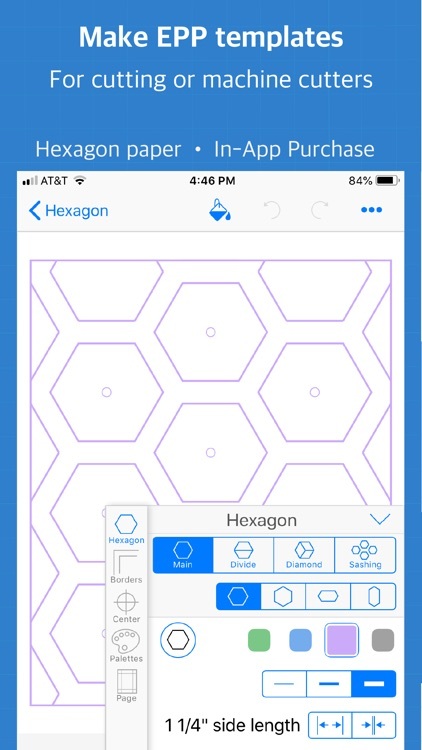 A special shading feature makes it easier to see block patterns and rotations to help designers get the grid ‘just right’. Jewel grids! A choice of layouts make creating unique grids fun. Then, once the design is finished, create papers with a jewel piece set to the actual, exact size and create paper piecing templates! Tell us if you can’t create the paper you need. 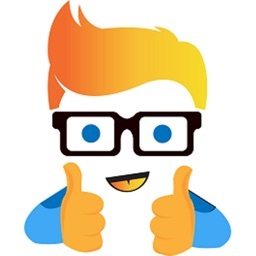 Send an email and we’ll see what we can do!